The diminutive “ultra metal-poor” star is called 2MASS J18082002–5104378 B – hereafter abbreviated to J1808-5104 – and it was discovered by a team of astronomers led by Kevin C. Schlaufman from Johns Hopkins University. At an estimated 13.53 billion years old, it’s among the first generation of stars to have appeared after the Big Bang, which happened 13.7 billion years ago. Not only is it one of the most ancient stars in the Milky Way, it could be among the oldest stars in the entire Universe. Details of this finding are set to be published in an upcoming edition of the Astrophysical Journal, but a pre-print has been posted to the arXiv. Indeed, the discovery is challenging preconceived notions of what the earliest stars were like and where they’re located. The first generation of stars to appear after the Big Bang were exclusively composed of elements like hydrogen, helium, and trace amounts of lithium. When these primordial stars exploded as supernovae, they peppered the cosmos with heavier elements that were incorporated into the subsequent generation of stars. Thus, the metal content, or metallicity, of stars increased as the cycle of death and birth continued over the eons. To date, astronomers have detected around 30 ancient, metal-poor stars, which tend to be as massive as our Sun. But J1808-5104 is a mere 14 percent the mass of our Sun, leading Schlaufman and his colleagues to speculate that it’s a red dwarf. The newly discovered star, which the astronomers analysed with the Magellan Clay Telescope, Las Campanas Observatory, and the Gemini Observatory, is exceptionally metal-poor. 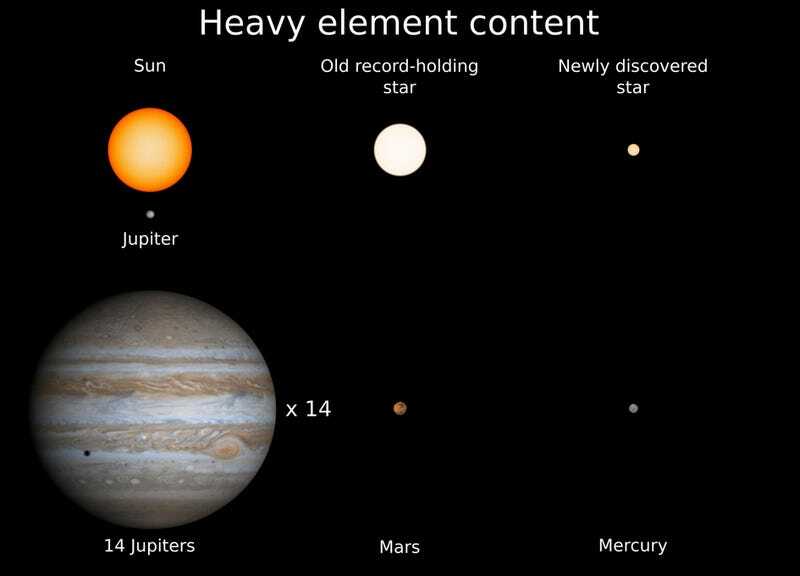 And in fact, it has the smallest amount of heavy elements ever observed in a star, having around the same heavy element content as the planet Mercury. The amount of heavy elements in J1808-5104 is so low, the researchers say it could be just one generation removed from the Big Bang. Prior to the new discovery, Caffau’s star was regarded as the most metal-poor star – a star only slightly smaller than our Sun. Stars the size of our Sun live for about 10 billion years, but low-mass stars like this one could theoretically burn of trillions of years. This star’s location in the Milky Way is also weird; J1808-5104 is part of the “thin disk” of the galaxy, which is where our Sun is also located. Old, metal-poor stars aren’t supposed to be located here, an active, crowded area that contains much younger stars. The finding suggests that the thin disk of the Milky Way is about 3 billion years older than previously thought. J1808-5104 is the smaller member of a two-star system. By measuring the larger star’s “wobble,” which is caused by the gravitational influence of the smaller star, the astronomers were able to infer the mass of J1808-5104. High-resolution optical spectroscopy was used to identify elements such as carbon, oxygen, iron, and others.